The parade of Kickstarted Steam indie darlings continues to march right onto the Switch eShop, and the latest notable addition is the popular Songbringer. On the surface this game ticks a lot of boxes for me: it’s a retro-affectionate top-down adventure RPG with a 16-bit pixel aesthetic and Zelda homages more obvious than the pointy Hylian nose on Link’s face. It’s the passion project of Nathanael Weiss, the one-man team behind Wizard Fu Games, and I’m nothing if not a sucker for ambitious small development teams. That said Songbringer also has a few elements that give me pause, and I had to really dig into it to get a good picture of what this game is and what it’s trying to accomplish. Songbringer isn’t just a retro-style Zelda clone—there are dozens of those, some mediocre, some transcendent—it’s also something I haven’t seen before: a procedurally generated Zelda-style game. I’ve been burned enough by the likes of No Man’s Sky and Strafe that the words “Zelda” and “procedural” anywhere close to being in the same sentence should make run screaming back to the comfort and safety of my ancient Super Nintendo, but something about Songbringer had me intrigued. Despite its overuse in the glut of lazy roguelikes and pie-in-the-sky proof of concepts, procedural generation doesn’t necessarily have to be a crutch or shortcut relied upon by sub-par developers. And Songbringer has fairly positive reviews on Steam, which is generally an honest indication of quality. Gritting my teeth and holding my nose, I dove in to see just what Wizard Fu had to offer. The game begins when the interstellar musician and party animal Roq crashes his space cruiser, the Songbringer, into the planet Ekzera. Roq awakes on the surface of the planet, scouts around for a bit, and then inadvisably ganks a totally sick nanosword from a nearby cave. This awakens the planet to his presence, and things start to spiral from there. Roq sets out with his floating robot companion Jib to put things straight and prevent the planetary catastrophe he unwittingly unleashed. Yes Songbringer, I do in fact remember the Nintendo. Pretty much everyone does, which is why Songbringer’s general aesthetic just feels a touch pat for me. This intro to the game, for me at least, was harsh the way a swig of flat Tab in the morning after a drunken Mario Kart tournament is harsh; it gets rid of the dry mouth but the stale, lingering artificial sweetness isn’t exactly pleasant. Thankfully once you get past the intro, Songbringer’s mechanics are actually rather clever. Songbringer generates each “run” from a 6-digit seed value, which randomizes its 10-or-so dungeons and overworld, but does so in a constrained manner. I want to stress that term because it keeps the experience from degenerating into an utterly chaotic, bugged-out mess. You get a different experience every time, but there’s some consistency. The algorithm selects several of the game’s key items and powerups, and then constructs the environment and especially the dungeons around those items. This way, a run is never impossible to complete. You won’t get stuck with a dungeon that you can’t finish because you’re missing the required item; you might just have to leave that dungeon and explore the overworld a bit more to find the item that you’re missing. The game also tends to give you consumable powerups in semi-regular drops, and this puzzled me for a moment. Most adventure RPGs won’t give you a puzzle you can’t solve without whatever ammo or powerup existing abundantly on-hand, usually in the same room as said puzzle. I’ve become conditioned by this mechanic, so at one I wandered around a dungeon for several minutes before using one of the bombs I had in my inventory. I’d only been using these bombs for combat so far and didn’t realize they could blow up barriers too, mostly because the game didn’t lock me in a room that I had to bomb my way out of right after I first got the bombs. I just sort of picked them up from a random dead enemy, and the game told me which button combo used them, and dispensed with further hand-holding or fanfare. To be frank this kind of embarrassed me. It reminded me of the original Metroid, where yes, it expected you to sit there and farm small enemies until you had enough missiles to crack open that red blast door. Songbringer has that vague sense of uncertainty, that incentive to throw stuff at the wall to see what sticks, but unlike other recent roguelikes it never reaches the point of tedium or aggravation. The result of this carefully curated procedural algorithm is a game that plays consistently, and more impressively is able to spool out its story roughly the same way each time, even though the overworld structure is different or you ran the dungeons in a different order. It’s something Nintendo didn’t even try full-bore until 2013’s A Link Between Worlds, which let you rent items necessary for progression and tackle dungeons in any order. That said, Songbringer has much more in common with the original 1986 Legend of Zelda for the NES and Famicom Disk System. The coolest aspect of Songbriger, however, is that the game capitalizes on this procedural element the same way Minecraft does. Instead of bludgeoning you with its obtuseness the way so many modern roguelikes do, Songbringer encourages you to experiment with different seed values. If you like a particular run you can write down that 6-digit seed and save it or give it to a friend. You can even enter random values just to see what comes out the other side. 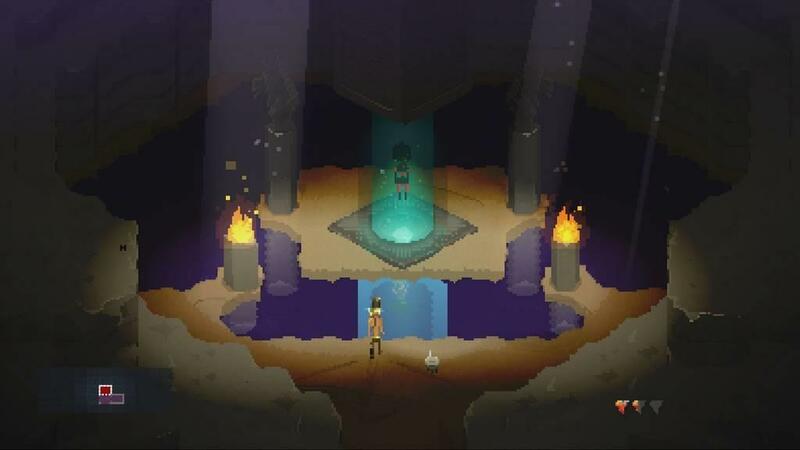 Songbringer is a clever little Zelda clone that puts an adaptive spin on a very old formula. I wish I liked the game’s aesthetic better. 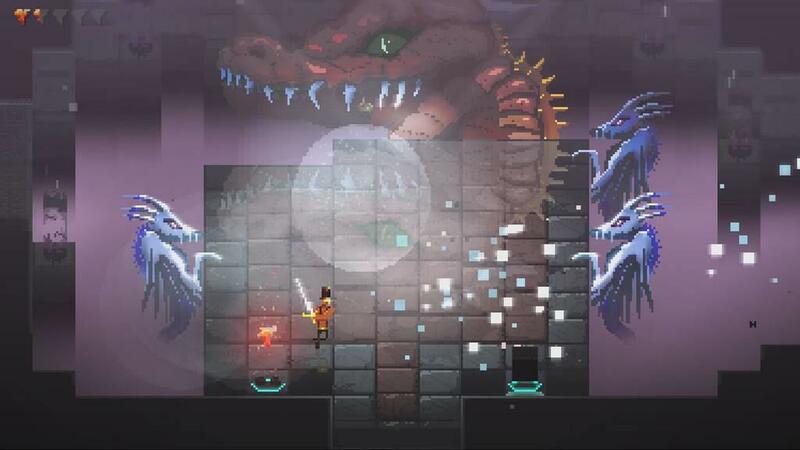 Songbringer’s visuals aren’t ugly, but its devotion to pixel art is a touch slavish. There’s something a bit rough about the way it looks; the art style hurts my eyes a little, as if the edges need buffed off. I know that’s a pretty stupid thing to say about a game that emphasizes a blocky, pixelated art style, but I’ve seen so many such games over the past decade that I’ve developed an eye for what I like. Songbringer’s style isn’t amateurish, but it feels more like a rough-cut gemstone as opposed to a polished emerald, the way the impeccably animated, perfectly color-balanced spritework in games from Wayforward look. 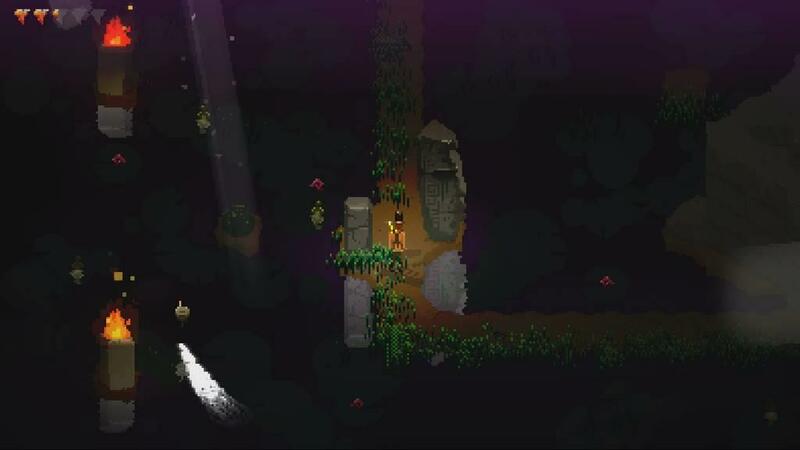 On the other hand, Songbringer does some very effective and evocative things with lighting. Nearly every light source in the game can be destroyed, plunging wooded hollows and dungeon rooms into smoky, low-contrast darkness. I’m also pretty sure that the algorithm arranges light sources to guide the player’s eye toward progression. This kind of subtlety is sorely lacking in many modern games, which all too often take the easy way out by dropping in an ugly, neon tutorial arrow pointing the right way. I always appreciate nuanced use of lighting to hint at where you need to go, and the fact that this is organized by a procedural equation and not an artist is all the more impressive. 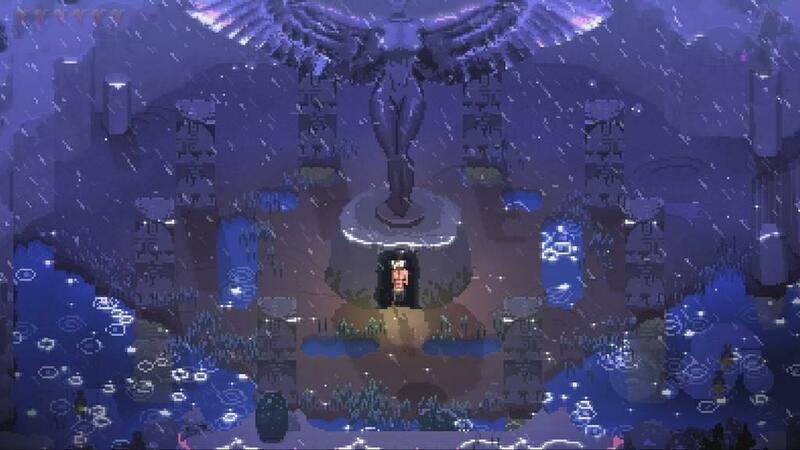 Ultimately, Songbringer was a frustrating experience for me, possibly because many things about it were so subjective. The emphasis on 80s nostalgia and somewhat blunt self-referential humor grated on my nerves, but I wholeheartedly admit that the gameplay is fluid and functional, and the restrained use of procedural generation to create functional and intuitive environments is remarkable. Nathanael Weiss is nothing if not talented in a variety of fields, and I can’t wait to see what Wizard Fu Games comes up with next. 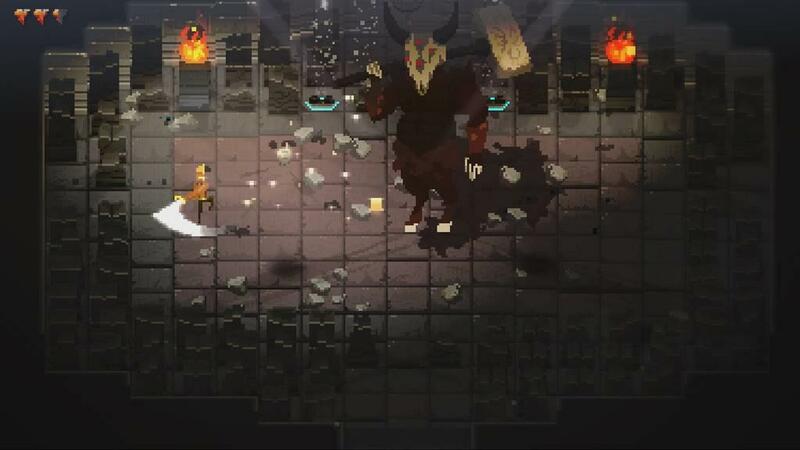 For now, if you think you would enjoy a goofy, scifi spin on classic Zelda that you can conceivably play over and over again, Songbringer is an easy addition to your collection of Switch indie hits. Songbringer’s general aesthetic and sense of humor rubbed me the wrong way, but the procedurally generated worlds are actually a lot of fun to get lost in, and the art style and music, though occasionally harsh, have a lot of love and nuance put into them.